After a week off last weekend, Ohio is back in action this weekend, which means it is time for another edition of the mid-major betting report. The Ohio Bobcats have now reached the Top 25. The latest BCS Standings show Ohio in the No. 24 spot. This is the first time the Bobcats have cracked the Top 25 in the BCS Rankings in school history. There is still an outside chance that if Ohio wins out, they could get into a BCS bowl. I’m following the Bobcats players on Twitter, reading reports from Ohio beat writers, and reading transcripts from press conferences to become an expert on this Ohio Bobcats team. The goal of this weekly report is to show how specialization is a profitable betting strategy. Last year’s mid-major betting report, which followed the Rice Owls, made $100 per unit bettors $1,280 in profit based on a record of 7-2-1. At the end of each weekly article this season, I will make a selection for that week’s Ohio Bobcats game. Doc’s Sports Unit Betting System will be used for every pick, which should help readers follow along and track the results of these weekly college football picks. 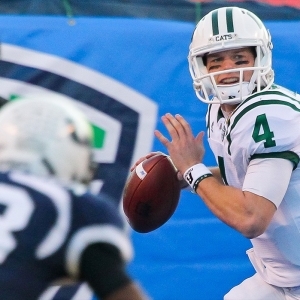 The Bobcats were off last weekend, but they picked up a 34-28 win over Akron two weeks ago. Ohio led 34-14 going into the fourth quarter of that game, but Akron came back and gave the Bobcats a scare in the fourth quarter. Akron actually ended up with 15 more total yards than the Bobcats (456 to 441). Beau Blankenship led the way for the Ohio offense with 109 rushing yards against the Zips. Tyler Tettleton was only 13-for-27 passing, but he did have two touchdowns and no interceptions. One area of concern for the Bobcats offense is their lack of success on third downs. The Bobcats were 3-for-14 on third-down conversion attempts against a subpar Akron defense. On the positive side, the Bobcats once again won the turnover battle. My selection on the Akron vs. Ohio game was ‘over’ 67. Both teams moved the ball well, but they came up just a bit short of the number. --Blankenship was a guest on ESPNU’s “UNITE” show on Monday evening. He talked about setting personal goals before the season, but keeping them private because the larger goal is how the team performs. In addition, he talked about picking up the first win of the season in Happy Valley and how winning in that environment gave the team a ton of confidence. Blankenship is eighth in the nation in rushing with 951 yards on the ground. --Doesn’t it seem like the Ohio Bobcats have been dominating when it comes to the turnover battle on a weekly basis this year? It seems that way because they absolutely have been. Ohio is second in the nation in turnover margin. The Bobcats have forced 18 turnovers, and they have only turned the ball over three times so far this season. --Jason Grooms, assistant athletic director for football operations, put up an interesting tweet on Twitter early this week. Grooms said, “Rankings are great and the program is on the rise! But we are only as good as our next game.” Several Ohio players re-tweeted this quote in the hours after it was made. It’s all part of trying to keep the players motivated for each week’s matchup. -Jason Arkley, beat writer for the Athens Messenger, reported that the Bobcats had a rare Monday practice with pads this week. Coach Solich may well have wanted to get the team going a little earlier this week because of their bye week last weekend. Arkley also reported that free safety Gerald Moore will be a game-time decision this week due to an ankle injury. Defensive End Tremayne Scott has been ruled out for this week’s contest. --Ohio is 6-0-1 ATS in their last 7 games following a bye week. --The Bobcats are 0-5 ATS in their last 5 against a team with a losing record. --Miami is 1-6 ATS in their last 7 games overall. --The “over” is 4-0 in the Bobcats last 4 games following a bye week. BetOnline opened the Bobcats as a nine-point road favorite in this one. The line has slowly moved toward the home underdog, and as of right now the Bobcats are favored by seven at all the major books. The posted total opened at 60 points, and there has been no movement from that level thus far. Ohio is a well-balanced offensive team, and I think that will give Miami a lot of trouble. Tettleton hasn’t been quite as sharp of late, but he might not have to be terrific in this one. Miami’s run defense is allowing 244 yards on the ground per contest. Look for Blankenship and Boykin to do quite a bit of damage in this one. Overall, the Redhawks defense has allowed 49 points or more three times already this year. At the same time, Miami has a good veteran quarterback in Dysert, and Ohio’s secondary is very beat up right now. The Bobcats have allowed 31 points per game in their last three contests. Both teams are coming off a bye week, and I think the offenses will be well-prepared for this MAC showdown. I see this as a game that has a lot of potential to end up being a shootout. My selection for this week is a t3-unit play on over 60 points. Doc’s Sports wants to give you a great offer to try out our expert college football handicappers for free with no obligation, no credit card required and no salesman ever! These are the same college football picks that our clients receive from any of our Advisory Board handicappers and you can get $60 in picks credit in minutes. Click here for more details and to take advantage of this free $60 picks credit today.